Nia Robinson spikes a kill. The sophomore outside hitter leads the team in kills. This weekend, Northwestern will travel to the No. 8 Wisconsin and the No. 3 Minnesota to battle tough conference rivals in consecutive days. Winless thus far in Big Ten play, the Wildcats are looking to bounce back into the win column following a three-set loss to No. 7 Illinois this past weekend. While the Badgers and the Golden Gophers present tough challenges for NU (10-8, 0-6 Big Ten), this weekend’s matches have the potential to turn around the season. The Cats are a young team. While the team returned 11 players from last year’s 14-18 team, none of those 11 are seniors. Third-year head coach Shane Davis said he is aware of the team’s youth but is happy with how they’ve developed. 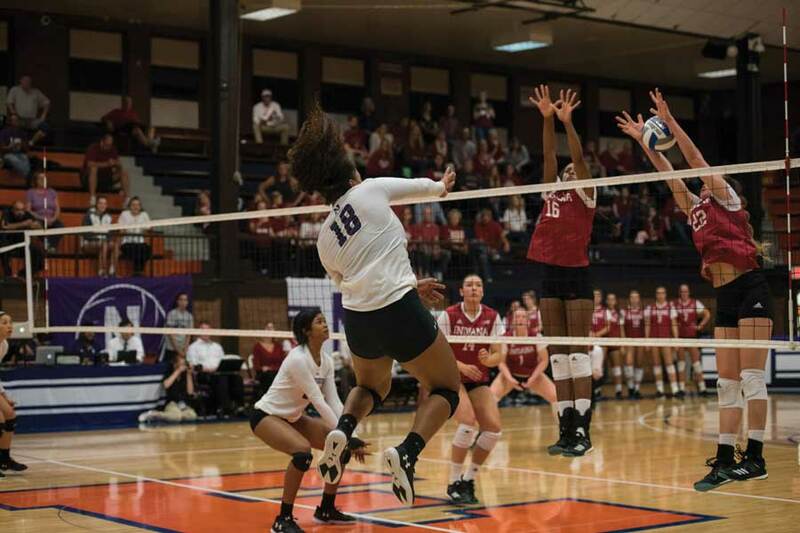 For sophomore outside hitter Nia Robinson — who has 96 more kills than the next highest player despite missing three matches — the team’s youth is an advantage rather than a deterrent to NU’s future. While excitement for the future is high among the Cats players and coaches, a true test of their growth as a team will come this weekend in the form of Wisconsin (11-3, 4-2) and Minnesota (12-2, 6-0). Friday, NU will travel to Madison to face the Badgers, who are coming off an upset loss to unranked Iowa on Saturday, as well as a previous loss to the Golden Gophers. The Badgers are led by 6’8” sophomore middle blocker Dana Rettke and sophomore setter Sydney Hilley. Rettke leads the team in kills and blocks, while Hilley leads the team in assists. Saturday’s opponent Minnesota, on the other hand, remains undefeated in conference this season and is coming off a huge conference victory against then-No. 3 Nebraska. This victory assured the Golden Gophers sole possession of the top spot in the league, and elevated their ranking up to third in the nation. On Oct. 3, Minnesota traveled to Evanston and defeated the Cats in consecutive sets. NU, however, is looking to take the lessons learned from that match and direct them toward its next matchup against the Golden Gophers. Davis said this weekend will show the the Cats how much they’ve grown.